Hub 51 Disenchanted Christmas defector? Festivityless Jew? Either way, you’ve got a home in Hub 51, when the restaurant celebrates “Hubukkah.” (Don’t ask about the name. We have no idea.) On special that night: Chicken egg rolls and Manischewitz sangria. Spinning: DJ Alex Rage. The full menu’s available, too. 4pm–2am. 51 W Hubbard St (312-828-0051). El: Red to Grand. Bus: 22, 29, 36, 65. Average main course: $20. Big Jones If you’re the type to open all your gifts on the 24th, Andersonville’s Southern spot may be your speed. 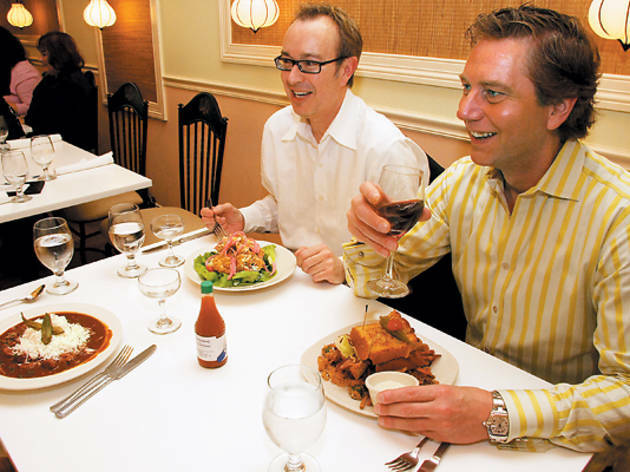 The four-course prix fixe offers a soup course, a salad course, an entree (such as goose gumbo with pickled okra) and a dessert (rum-and-nutmeg bread pudding). 5347 N Clark St (773-275-5725). El: Red to Berwyn. Bus: 22, 50, 92. Average main course: $18. 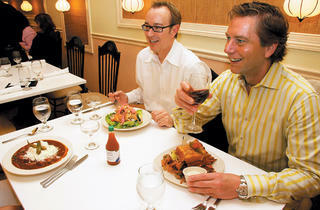 Bin 36 December 24th has added meaning for Bin chef John Caputo—it’s his wedding anniversary. How does he channel all that happiness? By throwing his annual Feast of the Seven Fishes, a five-course meal featuring chestnut pasta with cod dumplings, roasted lobster and more. 339 N Dearborn St (312-755-9463). El: Red to Grand. Bus: 29, 36, 62. Feast: $65. LM Planning to eat big for Christmas? LM’s Christmas Eve prix fixe might be the modest pre-game meal you’re looking for. Just three courses, with no more than three choices per course (options include turkey confit and chestnut risotto). And at $35, the price is somewhat modest as well. 5–9pm. 4539 N Lincoln Ave (773-942-7585). El: Brown to Western. Bus: 11, 49, 50. Christmas Eve prix fixe: $35. Balsan Restaurant food, familial feel. At Balsan, such a thing is possible. The three-course Christmas dinner here—a tasting menu including charcuterie, pan-seared scallops, prime rib, mussel tortellini and spice-cake buche de Noel with eggnog ice cream—is served on big platters, family-style. 1–7pm Dec 24 and 25. 11 E Walton St (312-646-1400). El: Red to Chicago. Bus: 36, 66, 143, 144, 145, 146, 147, 148, 151. Christmas dinner: $59. Buona Terra Ristorante It’s business as usual at this urban Italian haunt, which means Parmesan-crusted New York strip steak, fresh mozz wrapped in prosciutto and boozy housemade tiramisu will all be available. Reservations are probably necessary. 2535 N California Ave (773-289-3800). El: Blue to California. Bus: 52, 74. Average main course: $12. Mercat a la Planxa Mercat’s Spanish Christmas spread includes traditional tapas such as a serrano ham-and-fig salad, as well as bigger plates: slow-roasted ham, grilled lamb chops and diver scallops. Meal also served on Christmas Eve. 638 S Michigan Ave (312-765-0524). El: Green, Orange, Red to Roosevelt. Bus: 1, 3, 4. Christmas dinner: $68. Sugartoad Got a localvore to shop for this holiday? Give the gift of Geoff Rhyne’s farm-focused three-course Christmas dinner, which includes choices such as chestnut soup with apple chutney, short ribs with smoked dates and pickled pearl onions and cheesecake with a winter fruit salad. 11am–8pm. 2139 City Gate Lane, Hotel Arista Naperville (630-778-8723). Christmas dinner: $45.